The London Fairness Commission was established to ask ‘is London a fair city?’. The Commission organised conversations across the capital to discuss this question, which was the first city-wide debate on fairness for over 100 years. The first phase of the London Fairness Commission began in June 2015, and the third and final phase concluded in March 2016. Here is the final London Fairness Commission Report, and here is an Executive Summary. We part funded the London Fairness Commission, which was established by Toynbee Hall and My Fair London. It was chaired by Lord Victor Adebowale, and comprised of expert commissioners from across the worlds of business, research, health and charity. The first phase of the London Fairness Commission lasted from June 2015 to September 2015. How could London be a fairer city? Responses were received through a digital ‘Call for Ideas’ in partnership with the Guardian newspaper, seven evidence-gathering sessions with expert organisations, a survey of two thousand Londoners, and focus groups with young Londoners and business leaders. 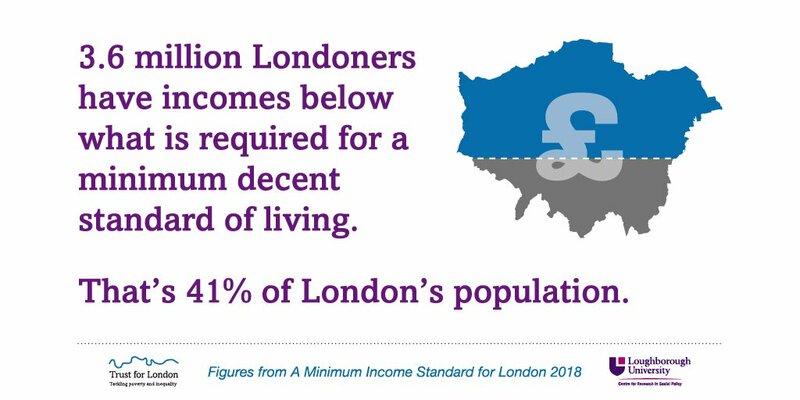 The second phase of the London Fairness Commission began with the publication of an Interim Report, which outlined the findings from the first phase and focussed discussion on issues of housing, income and wealth unfairness in London. To mark the publication of this report, a London Evening Standard sponsored debate was held at the Guildhall, before holding five ‘open space’ events throughout the autumn. These were collaborations with the London Voluntary Services Council, Race on the Agenda, London Youth and Age UK London, bringing together hundreds of Londoners to discuss their ideas for building a fairer London. The third and final phase of the London Fairness Commission lasted from December 2015 to March 2016. The Commissioners began to construct policies that would address the issues of unfairness they had heard in the previous two phases. Under 10 headline areas, the Commissioners agreed a range of specific policy recommendations that form the basis of their Final Report. The introduction of a London minimum wage of £9.70. Delaying issuing the Freedom Pass from 60 to 65 years and means test it instead. Action to make employers help more with childcare costs. Public disclosure of pay ratio data from companies and public sector bodies in London. Ensuring that companies registered offshore declare details of property ownership. Giving the Mayor of London powers of compulsory purchase on land owned by offshore companies who are unwilling to declare the name of the ultimate beneficial owner. Suspending right to buy for five years while supply is increased, and providing a portable discount for those who have lived in social housing for 15 years. Reducing or controlling the average cost of letting agents’ fees and charges. Setting ‘affordable rents’ to 30% of household income rather than 80% of market rent. Taxing land owners in London with planning permission for new homes who refuse to develop their land for longer than 3 years.